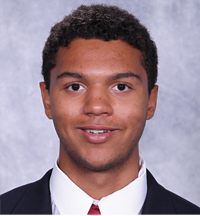 Monday evening, the U.S. National Junior Team picture began to take shape when USA Hockey unveiled its 29-player preliminary roster. Those 29 Americans will compete for 22 roster spots in Team USA’s pre-tournament camp in Camrose, Alberta, Dec. 17-23. The final roster will be announced Dec. 22 and there’s bound to be a few entertaining battles to get there. The best thing about the pre-tournament camp is getting the compete level raised before the puck is dropped against Denmark on Dec. 26. Sometimes that fear of getting cut motivates players to rise to the occasion. We’ll talk more about the camp itself soon, but first, it’s time to break down this 29-player roster. We kick it off this morning with the two goaltenders and 10 defensemen USA Hockey has invited to camp. As expected, USA Hockey decided to finalize the goaltenders for the team before camp. The U.S. will welcome back Jack Campbell, a veteran of the last two World Juniors, and John Gibson. Meanwhile, Andy Iles has been named an emergency back-up and will not attend the camp unless one of these two guys goes down with injury. By bringing just the two goaltenders, there’s no controversy. It allows both Campbell and Gibson to focus on the task at hand and get locked into the tournament for a full 10 days with the rest of the group. No need to make a goalie overly anxious before the puck drops on the real thing. This is the strategy that has been used the last two years with excellent results. There’s not much left to be said about Jack Campbell that hasn’t been already on this blog. He’s won three gold medals in IIHF competition, two at the U18 World Championship and one at the WJC. He’s posted the most ridiculous international stat line. He’s won numerous awards. When it comes down to it, there’s no one USA Hockey would rather have between the pipes with the game on the line. In his last year of eligibility for this most important tournament, expect Campbell to bring his A game. He’s as competitive and motivated as ever, guaranteed. That’s a scary thought for everyone else. Jack Campbell is a winner on the international stage. Guess what? So is Gibson. The 1993-born goaltender was between the pipes as the U.S. National Under-17 Team captured the World Under-17 Challenge title in Timmins, Ont., in 2010. Then, last April, he started every game as the U.S. Men’s National Under-18 Team earned its third consecutive gold medal at the IIHF World Under-18 Championship in Crimmitschau, Germany. Gibson was named the tournament’s best goaltender. On top of that, he’s having a solid rookie campaign in the OHL with the Kitchener Rangers. While his season numbers are better than Campbell’s, don’t expect the younger netminder to unseat the proven veteran. That said, Gibson is likely the go-to guy for the 2013 WJC. Having him on the roster gives him experience. He’s not just there for the experience though. Gibson quite honestly can play. He might get a game in, or at least a little bit of game action. They can have complete faith in him. This group of 10 players raises a few questions. Because of those questions, it’ll be very difficult to predict who will make the final roster. As hard as it may be to believe, this is a fairly wide open race. There are at least four spots that are just plain up for grabs and another three that I can’t honestly say are solidified. The competition should be fierce. The coaches have undoubtedly intimated to the players what role they need each to play and it’ll be up to the players to prove they can fill those assignments. The depth isn’t what I thought it would be coming into this season, but the top end is certainly going to give the U.S. a chance. Clendening is a slick, puck-moving defenseman that has good offensive instincts. He’s a two-time member of the U.S. National Under-18 Team, winning gold at both the 2009 and 2010 World Under-18 Championships. His international experience, as well as his often solid play with BU is going to give Clendening a good chance to be a part of this team. He was a late cut from last year’s U.S. National Junior Team and it stung a little more because Clendening is a native of Western New York. Being robbed of the chance to represent your country in your backyard has to be a bit of a motivating factor to not let missing the team happen again. Clendening’s offensive capabilities are going to keep him in the mix. He’ll have to prove he can make sound decisions with the puck, while also protecting his own end before jumping into the offensive foray. As long as he picks his spots correctly, he’ll have a good shot of making the final roster. Faulk’s inclusion on the team is iffy. The odds of him being made available by the Carolina Hurricanes for this tournament seem to get slimmer by the day, as the young defenseman continues to impress. Faulk could conceivably miss the entirety of the pre-tournament camp and still make the team. You better believe USA Hockey will wait until the last possible second, just to see if he’ll be available. They know what he brings to the table and he’s clearly proven he can play at the game’s highest level. Like Johannson said, if the kid sticks, you’ve got to be happy for him. If he’s available, well… you’ve gotta be happy for him and USA Hockey. Forbort is another returnee from last year’s team, which gives him a huge advantage over other defenseman. He’s got great size and plays a smart game. Despite the size, he is not physically dominant and can be a bit passive from time to time with the body, but he’s got a great defensive stick and knows how to use it. Forbort is likely to be back on the roster and should be a guy that can help out at both ends. His offense hasn’t come around as many expected it to, but he’s becoming more defensively responsible. In Forbort’s case, I think experience wins out, but he’ll have to prove that he’ll do whatever it takes in the defensive zone to gain a more significant role on Team USA. The biggest surprise among blue liners invited to the pre-tournament camp, Gravel certainly brings some versatility. He’s a big body at 6-4, 190, but he’s mobile and can fit into a variety of roles. The U.S. will need him to bring a responsible, shut-down style game and be physical. All things Gravel is capable of. He’s got a hefty competition on his hands, but is going to have every chance to earn a spot. Gravel isn’t going to score points, and that’s not what the U.S. is bringing him in for. Can he keep up with the world’s elite? That’s the question he has to answer in camp. When Stephen Johns is playing his best game, he is a frightening human being. One of the strongest kids I saw in my time at the National Team Development Program, Johns brings a blue-collar work ethic on and off the ice. Now, at age 19, Johns has grown to 6-foot-4 and 221 pounds of solid muscle. His body checks are often violent. He’s tough to knock off his skates and is a nightmare along the walls for his opponent. Johns has that grit and toughness the U.S. will need against its most physical preliminary round opponents. There is one caveat. With all that brute strength and toughness, Johns has to remember when to unleash it and when to reign it in. He can be an oft-penalized player and that is no good for a tournament like the World Juniors. Johns has to pick his spots well and not always go for the message-sending hit. If Johns convinces the U.S. staff that he can avoid penalty trouble and make good decisions on the ice, he’s got a great chance to be part of this team. He is to be feared when at his best. Jones is by far the youngest player coming into this camp, having just turned 17 in October. Don’t let his youth fool you, though. He’s a mature player who makes good decisions and rarely panics. He was dynamite at the 2010 World U18 Championship as an under-ager, logging Top-4 minutes for Ron Rolston’s squad en-route to gold. Jones has been hyped up since he was 14, but he’s continually lived up to it. There’s no question about his inclusion in this camp. As long as he plays his game, he’s on the team. His best is going to be better than most of his competition’s. Levi may have made his best case to make this team in August at the National Junior Evaluation Camp. He made it all the way through each cut at camp and was one of the few standing at the end. They obviously liked what they saw then and haven’t seen anything this season to detract from that. Levi can play a physical game, but has the ability to contribute a few points here and there. He is going to have to battle extremely hard for a spot. Levi looks like he might have a shot at the seventh D position. In that slot, he’d be required to play that physical game and be able to handle sitting a few shifts here and there. Could be a head-to-head competition between Levi and Johns when it comes right down to it. There was some doubt whether Merrill would even end up on the camp roster at all after a team-imposed suspension wiped out the first half of his season at Michigan. With no games played and character concerns, Merrill was lucky to have had an on-ice track record to save his chances on this club. 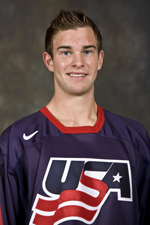 He was Team USA’s most productive defenseman in the 2011 WJC and played well for much of the tournament. He continued his solid, if not stellar, play throughout the remainder of the season, helping Michigan get to the national title game. Here’s the thing. If Jon Merrill has little or no rust, he’s going to be one of the most talented defenseman in camp. That’s especially true if Justin Faulk is never made available. Despite that elite talent, there’s still doubt as to whether Dean Blais will keep Merrill in the mix. On paper, Merrill is going to be one of, if not the best defenseman in Team USA’s arsenal, but that’s simply on paper. Having missed the first half of the season and the potential for a distraction are both valid concerns. He’ll have an entire camp to calm those. If he doesn’t, he might be out. Jarred Tinordi is a monster. He’s 6-7, 212 and tough. Though he won’t be able to get into any scraps at the World Junior Championship, that fighting spirit is just what the U.S. will need in those tight, physical contests. Tinordi is also a good leader, having been a solid captain for the 2010 U.S. National Under-18 Team that won gold at the World Championship in Belarus. He’s respected by his teammates and trusted by his coaches. The best news is that Tinordi has taken great strides in his development over the last four years. He’s really beginning to come into his own and find what kind of player he’s supposed to be. Tinordi can move the puck a bit, but he’s best suited in that shut down role for Team USA. He doesn’t need to be jumping into the rush or trying to start one himself. Tinordi just needs to be steady, smart and bring that (in Brian Burke voice) truculence and belligerence to the ice that he’s more than capable of delivering. Trouba’s another youngster on this blue line, one of only two non-1992s invited, and he’s here for a reason. Trouba has some man strength and brings a physical edge to the ice. Not only that, but he can jump into the rush and contribute offensively. If Faulk is unavailable, Trouba might be one of the more versatile inclusions to this roster. The biggest thing he’ll have to overcome is the mental aspects of being one of the younger guys on the team. He’ll also have to prove that he is mature enough for this tournament. It’s a bit of an uphill battle for Trouba, as it would be almost unheard of to bring two underage defensemen to this tournament. I think Jones is in, for sure, but Trouba has a little more to do. Trouba skates with power and purpose, possesses an NHL-level shot and is unafraid of the physical game. His all-around abilities can give him that outside shot to make it, but he’s got a lot to prove in a short amount of time. He very well could be up to it, though. That’s it for the defensemen and goaltenders. This group is very solid for Team USA. There’s a lot of variety in the guys USA Hockey brought in on D and they have to be confident with the duo they put between the pipes. Coming up a little later today, a look at the 17 forwards selected to the U.S. National Junior Team preliminary roster.